Every gift from a family or best friend is a wish for your happiness! If you have gone abroad leaving your family or best friend behind, or in a long distance relationship, then you will understand how difficult it is to stay away from loved ones. Although you may chat with them on social media or phone as much as you like, you require something else to show how connected you are with them. This is where friendship lamps come in! Friendship lamps are long distance touch lamps. It is a networked Wi-Fi connected lamp that comes in pairs and sync over the network. These lamps glow in a particular color when either one of them is touched. 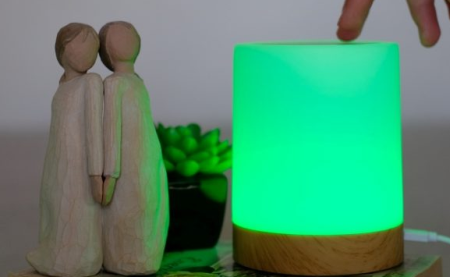 The color of the touched lamp will be displayed over the net on both the lights making you clued-up that your loved one is reaching out to you. Missing the friend you love the most is the feeling of active connection and human touch. If yours is a long distance relationship, whether it is the romantic, family, friendly, touch is the one first thing you realize missing. A simple hug suddenly seems more important when it's no longer an option. Friendship lamps bid so many benefits just like bringing your friend next to you.